Roman 'Brancaster type' gold finger ring. Researchers from Newcastle and Oxford Universities have for the first time catalogued in detail each of the 54 Brancaster-type rings known to exist in the UK today and say that they can be dated with confidence due to their design and the material they’re made from. Named after the Roman Fort and Norfolk village where the first example was discovered in the mid-19th century, a Brancaster ring is a type of signet ring with a characteristic square or rectangular bezel, inscribed with characters or text. Most of the 54 rings are made from silver, and a small number from gold. This contrasts with the early Roman period when the majority of rings tended to be made from bronze. They are also different to early Anglo Saxon rings, which were much plainer and rarer. As well as being worn as an item of jewellery, they were commonly used with wax to seal letters and other important documents. Seals were also often used as a security device to protect belongings in the home and while in transit. Writing in the German journal Bonner Jahrbücher, the research team say that the fact the rings are made from precious metals and were used with important documents and goods point to them being owned by wealthy, educated individuals – the elite of British society at the time. 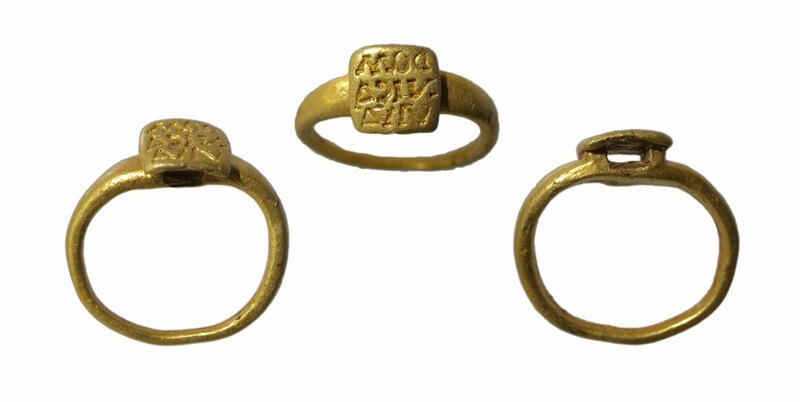 Dr James Gerrard, Senior Lecturer in Roman Archaeology, explains: “These were ostentatious rings and would have been a very visible sign of the wearer’s status and their confidence in expressing themselves as a Roman citizen. One famous Brancaster ring, the Senicianus ring, is thought to have inspired JRR Tolkien to write The Hobbit and The Lord of the Rings trilogy. The gold ring has been linked to a Roman curse tablet found at the site of a Roman temple in 1785, which said: ‘To the god Nodens: Silvianus has lost his ring and promises half its value to Nodens. Among those named Senecianus, let none enjoy health until he brings it back to the temple of Nodens.’ Nearly 150 years later, archaeologist Sir Mortimer Wheeler is believed to have discussed the ring with Tolkien, who was Professor of Anglo-Saxon at Oxford University at the time, after realising the ring could potentially be the one referred to by the curse. The rings were discovered over several years at sites predominantly in the south and east of Britain. Some were found during archaeological excavations at known villa locations but many were found as part of buried hoards alongside other artefacts such as coins and jewellery. A large number of rings were also discovered by metal-detectorists and reported to the Portable Antiquities Scheme. Many of the hoards that include these rings also contain large numbers of late Roman silver coins. In many cases these coins have been clipped around the edges. Tampering with coins was illegal during the Roman period and it is believed that this clipping dates to the fifth century. This is further evidence of the fifth-century date of the rings. The rings are engraved with a wide variety of designs. Some have what appear to be portraits of the emperor, soldiers or lovers while others feature several dolphins and mythical sea creatures such as sea griffins, which are frequently depicted in late Roman art. In addition, many of the rings also bear references to Christianity, either in the inscription or the images depicted on the bezel, such as doves or peacocks. These images have long been associated with Christianity, which had started to spread across the Roman Empire from the fourth century, when Constantine the Great converted and encouraged other Roman citizens to convert.